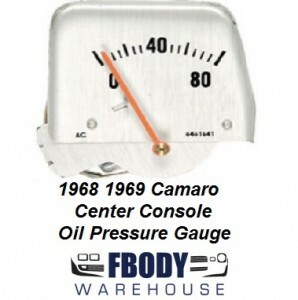 This is a new replacement center console mounted silver oil pressure gauge for use on 1968 1969 Camaro models with console mounted gauge package. This is a new replacement center console mounted oil pressure gauge with silver face for use on 1968 - 1969 Camaro models with console mounted gauge package. Brushed silver face with correct screened text and indicator lines reproduces the original factory installed gauge appearance exactly (unlike the discontinued AC/Delco replacement gauges).